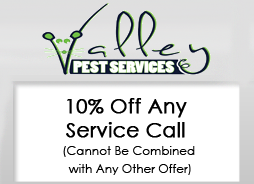 Valley Pest Services, based in Wayne, New Jersey, offers a wide variety of environmental pest control services with an emphasis on providing outstanding support and friendly service. With personalized service, a genuine concern for your home or business, and more than 30 years' experience, our family-owned-and-operated company is the smart choice for residential and commercial pest services, termite control, and bedbug treatment. Regardless of the type of pest problem you have, we are fully dedicated to achieving your complete satisfaction and trust with unbeatable service. Our owner goes to all jobs to ensure that everything is done the right way, and we'll come back until your pest problem is completely solved. Our clients always come first and satisfaction is guaranteed. Please ask about our First Responders & Veterans Discounts. Contact us today to schedule an appointment or receive an estimate for any of our pest services.